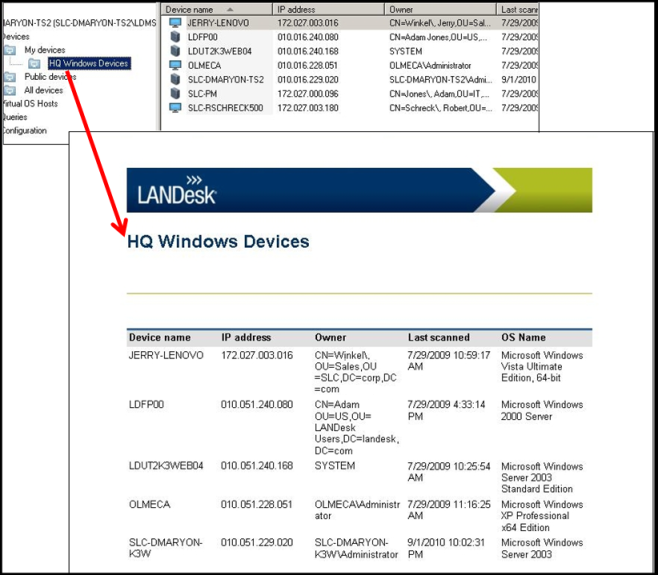 For example, an ad hoc report from a group in the network view shows a list of devices in that group. The columns in the network view (such as IP address, owner, and so on) are displayed in the report. To change the organization of the report data, modify the column set (add or remove columns or change their order) before you run the report. You can run a report for many tools, showing the items in a particular view (such as a list of alert rulesets in the Alerting tool). You can run a report for any query you create or for any group you have created in the network view or elsewhere. View as report: Right-click an item and select this option to view the data in a standard report format. A report preview window opens, and you can select different options before printing, saving, or sending the report. Export as CSV: Right-click and select this option to save the data in a comma-separated value file. New report: Right-click a query and select this option to create a new report based on the query. You can use a standard format or open the report designer to further customize the report. The new report is saved in My reports.